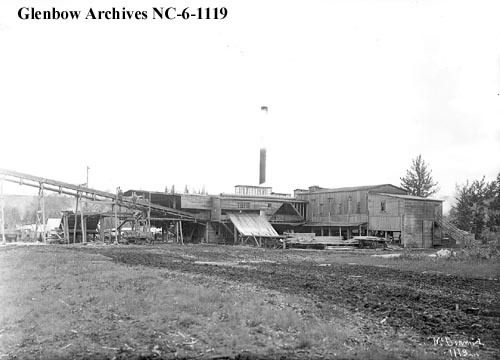 The district which would later be called Riverdale was the first industrial suburb of Fort Edmonton and is one of the oldest neighbourhoods in the city. Riverdale is like a small town unto itself, nestled as it is into a bend of the North Saskatchewan River and surrounded by high cliffs. It touches no other neighbourhood. Once it was a sunny stand of trees and home to the Cree, a First Nations people. The search for gold in the 1860s saw early European visitors, and they were followed in the next 30 years by settlers who established wheat fields, steamboat landings, ferries, lumber and grist mills, coal mines and a brickyard. Workers first lived on site, but soon spread beyond the bunkhouses. Everyone called this area Fraser Flats, after the owner of the lumber mill. Clay, water and abundant trees for fuel made this river flat a perfect place to make brick. The needs of a growing town and the enterprising spirit of James Brown Little combined in 1893 to found a century-long dynasty of brick makers. Said to be “the most consistently high-quality brick of its time,” the Little product helped build early 20th century Edmonton. J.B. and his descendants established many long-standing social traditions of the district and sponsored hockey and baseball teams for years. Today the brickyard has been developed into residential house, but J.B.’s brick house still stands and is home to a trendy café enjoyed by Riverdalians and river-valley visitors alike. In 1905 the area was subdivided and a land boom quickly saw the present residential shape take form. Determined and hard-working neighbours knit together a highly-textured social fabric that continues to this day: some families are sixth-generation. But it wasn’t always easy: life was disrupted by devastating floods, collapsing coal mines and uncaring governments. Despite the stiff odds, the residents always emerged victorious, and their neighbourhood has become a paradise regained. For the Riverdalians of today, home is a bountiful garden in the heart of a great city and a good place to grow up. 'Dogpatch' was a community in Riverdale east of 92 Street and south of 100 Avenue. It was known somewhat disparagingly as Dogpatch after the impoverished setting of the Li’l Abner comic strip, which ran in newspapers from 1934 to 1977. In the 1890s and early 1900s Riverdale was an inexpensive place for new immigrants to live, and D. R. Fraser's lumber mill and J. B. Little Brickyard provided jobs. Many newcomers to the area came from Holland, and the land between the brickyard and the river became known as the Dutch Settlement. This section of land belonged to brickyard owner James Little and he rented it out to people in an arrangement called a "ground rent". Although it never received water or sewer lines, people built modest homes, though today (and even then) some might be called shacks. While natural gas and electricity were available, life was hard. After the financial crash of 1913 work was difficult to find, and many Dutch settlers left the area. Over the years residents moved out or passed away, and the homes were sold to new owners. Though residents had little money, the rents remained low and most owners tended gardens and raised chickens. Water was drawn from a community tap and hauled home, and outhouses were the norm. Former residents have mixed memories about living in the area. Some recall the hardship of raising a large family in a tar paper shack, and trying to keep bedbugs off the children as they slept. Others reflect fondly on the area, being close to nature and with lots of children with which to play. In 1984 about 15 people still called this area home. The City had been concerned for years about the lack of plumbing, and pressured J.B. Little and Sons to evict the residents. In August of 1984 notices were sent around, giving people until March, 1985 to move out. Once all the residents had left, the City deposited the clay excavated during the construction of Canada Place (9700 Jasper Avenue) on the Dogpatch site, further obscuring it from public memory. Fire insurance plans like this were created by insurance companies to gauge the risk of fire to property, and are an invaluable resource for local historians. This page, from the 1950s, shows the location of the homes in Dogpatch, labelled "Squatters' Frame Shacks".